This home, bordering Irish Creek, in Talbot County, was originally designed as a weekend house for a family with three sons. Features include a circular pit in the Living Room which will seat 14 people. A fireplace serving the "pit" has an architect designed mural behind the chimney. The first floor contained a combined living room, dining room, kitchen with eating space, all of which opened onto a large triangular deck. The first floor also contained the Master Bedroom with a study balcony over accessed by a wooden circular stair. A large bathroom served the Master Bedroom and acted as a house bath also. The second floor contained a large sleeping balcony overlooking the living room, for the boys, along with a bath and laundry area. 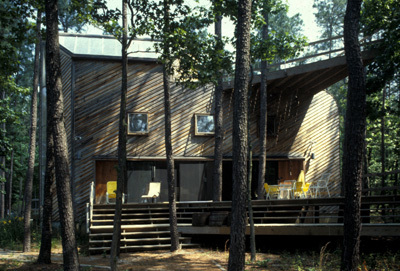 A third level balcony, again overlooking the Living Room, contained additional sleeping space, and accessed a large third floor deck look over the creek. 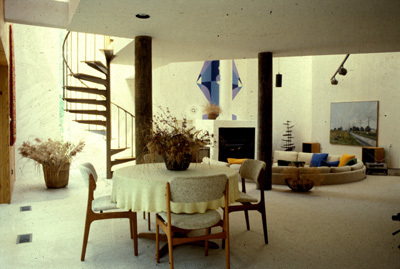 The upper floors were accessed by a circular stair. The stair is capped by a large sloping skylight. A vertical slot of glass designed to let light flood the living room wall around noon, rises from the first floor to the top of the third floor. 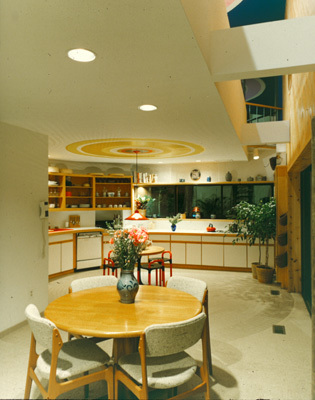 The kitchen has partially semi- round counters. After many years, the owners decided to find a lot with deeper water. 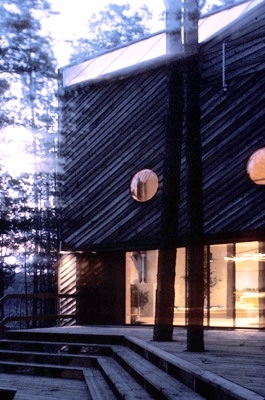 The architect, Mark Beck, was able to purchase the house from the owners. Additions and renovations then occurred to turn it into a year round family home.